HOMECan exercise help to prevent arthritis? Can exercise help to prevent arthritis? Despite the positive and undeniable evidence showing that it helps to lower blood pressure, improve circulation, lose weight and lower the risks of heart disease, stroke and diabetes, many people still believe that undertaking a regular exercise routine will ultimately lead to long term pain; injury; and arthritis. It’s true, exercise does carry an injury risk – but the extent of which will depend on the type and intensity of exercise you choose. However, this is not reason alone for adopting, or indeed continuing, a more sedate way of living. The Framingham Heart Study was a research project that started in 1948 in a town called Framingham in Massachusetts, USA. 5,200 residents volunteered to take part in a study that would provide major insights into the causes of heart attack and stroke. 45 years later, scientists began a new study on the children of the original cohort looking at the link between exercise and arthritis. The research was thorough and took into account their activity levels, injuries, stiffness and pain and included x-rays at different intervals during the study. The results were conclusive. Exercise did not cause arthritis. However, did it have a positive effect? Arthritis begins when the cartilage that cushions joints begins to wear away. Cartilage doesn’t have its own blood supply; it is not a part of the body’s circulatory system. Rather, it gets its nutrients from the fluid that surrounds it; the synovial fluid. 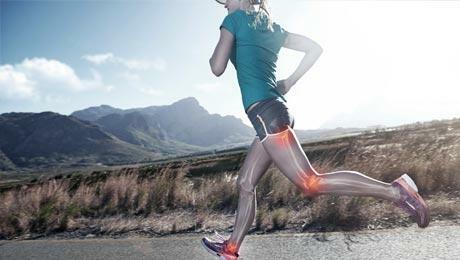 Exercise causes the joints to compress, which forces more of this nutrient rich fluid into the cartilage. So, could exercise in fact reduce the risk of osteoarthritis? The answer to that question came from an Australian study carried out at a similar time to the Framingham study. In this research, 297 men and women between the ages of 40 and 69 were monitored and evaluated over a 13 year period. All were healthy and had no history of knee problems. They were all weighed, monitored and each had a knee MRI scan at both the start and the end of the study. Those who performed the most vigorous exercise had the thickest cartilage. A conclusion that has subsequently been backed up by many similar studies since. So not only can we dispel the myth that exercise causes arthritis, we can also say that it helps to prevent musculoskeletal disabilities. So what are the risks of injury and pain associated with exercise? As specialist in musculoskeletal radiology, the majority of the cases I see have come about because of an accident or injury. Often this is due to improper techniques or insufficient training as well as overuse, sudden changes in direction and even falls. Don’t try to do too much too soon. Give yourself time to build up your regime over time. Don’t overdo it; remember to rest and give your body sufficient time to rest and recover. Don’t forget to warm up and cool down – stretching is as much essential as the exercise itself. Ensure you’re using the right technique and, if in doubt, seek advice. It’s an easy assumption to make that older adults or those with previous injuries are most at risk for joint problems. But the fact is, anyone can experience joint pain or injury if they don’t exercise caution with their chosen regime. If you are new to exercise, or if you have had joint problems in the past, I would always recommend talking to your doctor or getting advice from a qualified personal trainer before you start an exercise plan. And if you’re already suffering from some past injury that’s causing you pain and discomfort and stopping you from getting back to doing what you love, then why not make an appointment at the clinic?